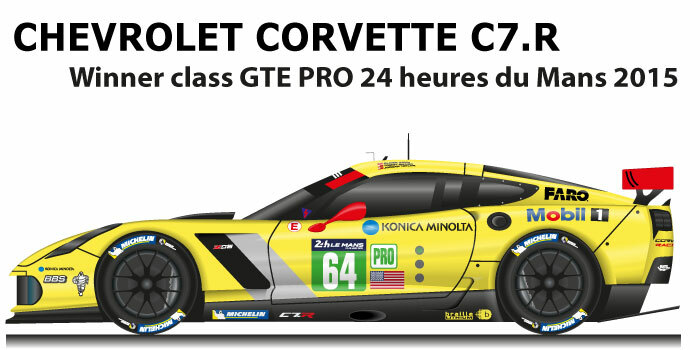 The Chevrolet Corvette C7.R n.64 is the winning car of the GTE PRO class at the 24 hours of Le mans 2015. In 2014 the Chevrolet in collaboration with Pratt & Miller Engineering develops the new C7.R based on the previous car the C6. R, designed by engineer Tadge Juechter, won four races in the year of debut: Long Beach, Laguna Seca, Watkins Glen and Canadian Tire Motorsports Park Racing. Oliver Gavin, Tommy Milner and Jordan Taylor at the wheel of the Chevrolet Corvette C7.R n.64 won the GTE PRO class at the 24 hours of Le mans 2015 and won the eighth Corvette Racing victory. With the victories he has the 24 Hours of Daytona in January and the 12 Hours of Sebring two months later with the guide Jan Magnussen, Ryan Briscoe and Antonio Garcia, the Corvette Racing has won the infamous “triple crown” of endurance racing with victories in the 24 hours of Daytona, 12 hours of Sebring and 24 hours of Le Mans.